The Camco 57293 Deluxe Grilling Table was designed to resolve one of the most common outdoor culinary problems. A suitable workstation that functions as its own kitchen. A well laid out, organised and functional workstation that allows the “chef” to have all the necessary utensils within easy reach. Therefore, allowing them to focus on the task at hand…cooking. The lightweight steel, multi level grilling table was designed to be foldable and comes with a zippered nylon carry bag, allowing for portability. As such, it was designed for use as a portable kitchen for tailgate events, picnics, RV camping or even for those everyday backyard gatherings. In this review, we will look at all the features of the Camco grill table. We will also go through some pros and cons to help you make a decision as to whether the Camco 57293 Deluxe Grilling Table is the grilling table to suit your needs. Anodized aluminium folding, removable, grill supporting tabletop. Stands at a height of approximately 32 inches and measures 26 x 16 inches. Frame supported, plastic laminated, fibreboard insert sideboards. Stand at a height of 25 inches, measuring 18 x 15.5 inches. Well, now we have seen the main features of the Camco 57293 Deluxe Grilling Table. By looking a little further, we can go through some pros and cons to see the areas where this product really shines and the areas where it could use some improvement. The Camco 57293 Deluxe Grilling Table has many great features. It is both lightweight and portable. It is also foldable and comes with a carry bag, making its easy to transport and easy to store away. This makes it an appealing piece of equipment for RV camping, picnics and even backyard gatherings. Its many other features such as hooks for hanging equipment, paper towel holders, and large size in general, help to make it almost perfect for its intended use as a grilling table. However, there are issues present that require extra expense by the user in order to be rectified. The slippery accordion tabletop presents a significant safety issue and would need to be rectified by adding some sort of non-slip surface. The fiberboard side tables would also have to be waterproofed or replaced, as they will warp when any moisture is present and render them useless. Therefore, if you do not mind spending a little extra effort and money to rectify the few small issues that it possesses, this grilling table could potentially make a great piece of equipment. On the other hand, if you are looking for a perfectly functioning outdoor grilling table that will work in all weather conditions right out of the box, then this product is not for you. Standing at 32 inches high when assembled, this unit is a great height for a grilling table. Not too high that you have to reach up when cooking, and not to low that you have to strain your back bending over when cooking. Standing at a comfortable height, it will allow you to enjoy your outdoor cooking experience. When assembled, this grill table measures 58 inches in width. The aluminium grill holding tabletop measures 26 x 16 inches. The sideboards measure 18 x 15.5 inches. All together, that means that you can comfortably fit your grill along with all your ingredients and equipment, without having to fight for space. The table is multilevel, with the sideboards sitting at a height of 25 inches. Therefore, as everything is stored at a lower height than the grill itself, there is no need to worry about any items getting knocked over whilst attending to the food cooking on the grill. 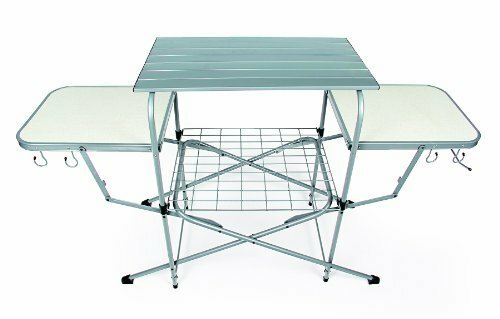 The Camco 57293 Deluxe Grilling Table has a simple fold up and down assembly design. The entire assembling process takes a matter of seconds, from start to finish. In under a minute, the grilling table is set up and ready for use. The aluminium table top is removable, foldable and slatted, and the plastic laminated sideboard inserts are removable as well. 4 utility hooks are strategically placed on the end of the sideboard for hanging grilling equipment. This allows you to have all your equipment conveniently located close at hand, whilst not taking up vital space on the side tables. Organize your equipment by hanging them on the hooks and use them as and when you need them. A paper towel holder is a very useful addition for a grilling table. Not only are they useful for those inevitable spills and messes, but also to clean greasy hands and greasy utensils. The wire shelf located below the aluminium table top provides a useful storage space for any extra utensils or equipment such as knives or extra pans. It is out of the way, but there for when you need it. The legs of the grill table have non-slip rubber feet. These protect the lightweight steel from damage and also prevent the grill table from sliding on slippery surfaces. Folding down to just 37 x 20 x 6 inches, this portable grilling table is excellent when it comes to storage. Relatively small, it can fit anywhere; in a closet, on a shelf or even in your garage. It’s small size when folded makes it a great space saver. Being foldable and small is useless if there isn’t a bag to carry it in. Fortunately this grilling table has it’s own nylon carry bag. Excellent for transport, use the handle loop to easily carry the portable grilling table from place to place. When you are finished using it, pack it up into it’s bag and store it. The durable nylon bag will keep it clean and help to protect it from scratching. The Camco 57293 Deluxe Grilling Table has many excellent features. However, there are a few downfalls in its design that should be highlighted. The grill holding table top is slatted, accordion folded aluminium. It is held to the frame with elastic cords that are included. The table top is also very slippery. Therefore, depending on the weight of your grill and the type of feet it has, the feet of the grill can easily slip and fall through the slats if they should move. This could, potentially, be rather dangerous. Especially if the grill were to fall whilst in use. Apart from being dangerous, it means that the table would have to be used on a completely flat surface. Even the slightest canter could send items sliding off the table top and crashing to the floor. The sideboards are made from fiberboard that is plastic laminated on the top. They are not waterproof. If the surface is left wet, they begin to warp. If left in the rain, they will warp severely and will become completely useless and need to be replaced. The user is required to take extra time, effort and expense in order to make the sideboards resistant to water or moisture.